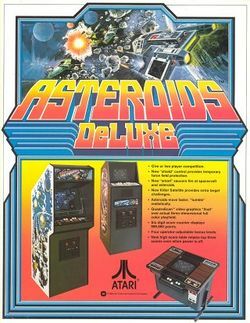 Asteroids Deluxe was Atari's answer to arcade operators who complained that expert players could hog an Asteroids machine for hours and prevent other players from depositing their quarters in to the machine. Asteroids was a popular game, but the problem was that many players had become so adept at playing, that the machines were raking in less money because some players could monopolize the machine for long periods of time. So Atari set out to enhance the original Asteroids as best they could. A new hexagon shaped enemy was added to the game. Known by names such as "Killer Saucer", "Death Star", or even "Snowflake", this enemy would appear on the screen towards the end of a round when few asteroids were left and slowly home in on your position. Shooting it would cause it to break up in to three diamond shapes that pursued your ship a little more quickly. Hitting each of the diamonds cause them to break up in to two wedges which chased your ship the fastest. Ultimately to destroy this enemy, you had to destroy six wedges. The player's spaceship has been redesigned somewhat. Although still the same relative size, the nose has been narrowed and two wings have been appended to the sides. It also has the same maximum velocity as the original ship, but the acceleration is twice as fast. Your ship has a new ability. Instead of hyperspace, you now have a shield. The shield has a duration of approximately 12 seconds per ship, and can not be replenished. When you are hit with the shield activated, the momentum of the asteroid is transferred to your ship and you will be sent flying. The control panel for Deluxe is identical to the original, which the single exception of hyperspace being replaced with shield. The shot accuracy of the large and small saucers have been improved. The large saucers fire 3 shots at asteroids and 1 directly at you. The small saucers fire 2 shots at you, and 1 at an asteroid. A graphical backdrop has been added to the game in an attempt to give the graphics the impression of depth. In some player's opinions, the background does little more than obscure the graphics, making it difficult to see where everything is. A light blue overlay as also been applied to the screen, giving the otherwise white graphics a blue shade. There is only one "model" of asteroid in the game, as opposed to the three or four different variations in the original game. However, this time the asteroids spin around their own center, and at different rates, providing just a small bit of extra realism. Asteroids Deluxe did the job of making the original Asteroids more difficult, perhaps too well. Commercially, it did not perform nearly as well as the original, and was generally considered a flop. In response, Atari released Space Duel, another game based on the Asteroids formula, to moderate success. Asteroids Deluxe was never officially ported to any system, not even Atari's own home systems. However, the shield ability is present in Atari's home conversion of the original game, and can be thought of as the inspiration for the decision to add it to Deluxe. This page was last edited on 29 March 2010, at 01:57.